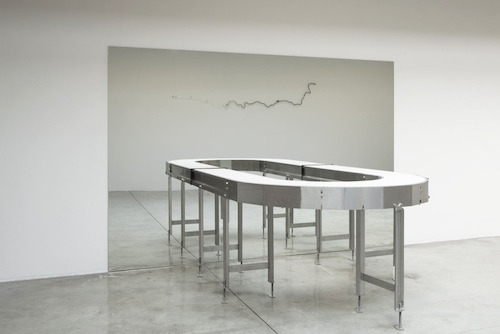 Agnieszka Kurant, Untitled, 2014, conveyor belt and mirror, mirror: 80 x 120 x 1/4“, conveyor belt: 36 1/2 x 79 x 60 1/2”. On encountering the empty wall-mounted tubing of Agnieszka Kurant’s End of the Signature, 2014, it is possible to miss the mere seconds it takes for dark neon to shoot through the twisting structureas if suddenly scrawled by an invisible handand materialize into a sign. For this work in the artist’s current exhibition, “Variables,” Kurant collected more than one hundred signatures and used specially designed software to merge them into a single, collective one, which a nearby machine writes and rewrites with a pen. Maps of phantom islands, one topographical, one color-coded for national territories, appear in a side gallery. The room is empty save for a soccer ball on the floor, an animatronic object that inches away, its movements so slight as to be almost imperceptible. Not seeing becomes as important as seeing: Kurant’s works, often automated like mechanical Turks, conjure art even with blind participation, influenced by economies in which play gets converted into labor. For A.A.I 1-6, 2014, the artist collaborated with a lab in Florida to deploy termites to build six mounds out of glitter, gold, and jewel-colored sand, echoing the Kurant’s stake in collective intelligence, a theme that pervades the exhibition. Placed on a pedestal in the gallery, the structures take on the authority of ruins and press at a democratization of mark-making. In a more minimal gesture, a U-shaped conveyer belt leads into a mirror, and our gaze completes the path of this fiction-generating device, forever feeding into itself with our gaze. Nearby, in Air Rights 1, 2014, a rock floats electromagnetically just above its plinth: Suspended between our world and one just beyond it, Kurant points to that exact location where understanding yields to astonishment.